NANJING, China, Feb. 13, 2019 /PRNewswire/ -- Suning.com ("The Company"), the Fortune Global 500 retailer owned by Suning Holdings Group, one of the largest commercial enterprises in China, recently announced the establishment of its Department Store Group, which will focus on professional operations of fashion department store business to strengthen its full-scenarios development in online-and-offline smart retail and improve the shoppers' experience.Â TheÂ Company will also acquire nationwideÂ all Wanda Department Stores, belongingÂ to Wanda Group, the large Chinese commercial real estate developer, to expand its bricks-and-mortar retail portfolios and facilitate the all-categories merchandise supply chain to satisfy more local consumers and boost Chinese retail market profits. As the leading omni-channel smart retailer in China, Suning.com has always been committed to building a full-scenarios retail ecosystem both online and offline to create diversified shopping experiencesÂ visible and ready to serve consumers anytime and anywhere. 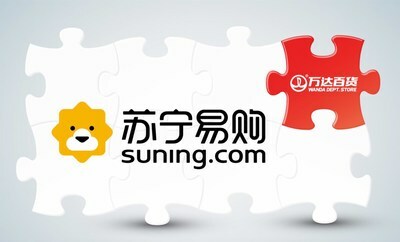 The establishment of the new group with acquisition of Wanda Department Store is expected to further reinforce Suning.com's offlin! e advanta ges, improving its overall retail network resources and increasing the business potential of the Company to develop new business opportunities of all-categories merchandise operation, especially of fashion, lifestyle products and fast-moving consumer goods. The 37 Wanda Department Stores are located in first- and second-tier cities in China, with more than 4 million registered customers. Through the deal, Suning.com will also bring its powerful technology capabilities such as data learning, artificial intelligence, IoT to accelerate the digitization ofÂ operation managementÂ for traditional department stores to increase the overall service experience and profitability of the industry. Zhang Jindong, Chairman of Suning Holdings Group said: "The prosperity of the physical retail industry must not only rely on the traditional model and experience. It needs to embrace innovative technology and market concepts to continuously create quality and customized services for consumers." Suning and Wanda has built a strategic cooperation since 2015 and strengthened the partnership in 2018 with the former's acquisition of a tiny stake in the latter's commercial management subsidiary. Founded in 1990, Suning Holdings Group is one of the leading commercial enterprises in China, with two public companies in China and Japan. In 2018, the company was ranked second among China's top 500 non-state owned enterprises for the third consecutive years, with annual revenues of RMB 557.875 billion (approximately EUR 69 billion). With its mission of "Leading the Ecosystem Across Industries by Creating Elite Quality of Life for All", Suning has gone from strength to strength, expanding its core business through diversified vertical industries: Suning.com, Logistics, Financial Services, Technology, Real Estate, Sports, Media & Entertainment, and Investment. Suning.com was listed on the Fortune Global 500 in 2017 and 2018.